An Australian junior petroleum producer wanting to increase its profile at home is set to take up some permits in central Australia from Beach Energy Ltd (ASX: BPT). 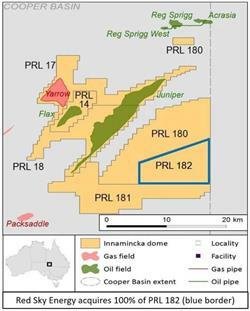 Red Sky Petroleum Ltd (ASX: ROG) has extended the time for a sale and purchase agreement with Beach subsidiary Acer Energy Pty Ltd for six petroleum tenements near the town of Innamincka in South Australia’s north-east. This takes in the former producing Flax oil field, the Yarrow and Juniper gas and oil fields and a 75% interest in a licence, for which the balance of 25% is being purchased from Bengal Energy. The purchase takes in production infrastructure, storage tanks, yards and camp facilities. Red Sky currently has production from the Gold Nugget gas field in Wyoming in the US but has indicated it wants to acquire onshore and offshore permits in Australasia and South-East Asia. Beach expanded its Australian and New Zealand assets through the billion dollar takeover of Lattice Energy from Origin Energy last year. This took in operatorship of the Kupe offshore field in NZ.